This is our Giantex wood garden raised bed. It is perfect choice for you to plant or display flowers and vegetables etc. This garden raised bed has a sturdy construction because it is made of fir wood and each wood slat is thick enough. Four wood legs arealso stable and give strong support for the whole planter. The size is big enough for you to raise any plant you like. Compared with common planter, our two side platforms provide much more additional space for you to display yourpotted plant or put your tools. We offered detailed and specific assembly instruction and show the assembly steps in picture form. 〖Enough Space for Planting〗- The size of this garden raised bed is 72.0''X48''X29.1''(LXWXH). It is wide enough for you to plant any flower or plant you love. 〖Two Additional Side Platforms〗- This is our special design. Two side wood panels are arranged beside the main raised bed. It offers additional space for you to plant or display potted plant or tools you need and like. It also has solid construction with the support of triangle frame under the top side platform. 〖Easy to Assemble〗- Our assembly instruction is detailed and specific. All parts are numbered and listed as well as shown in picture form which is easy for you to understand. 〖Appropriate Height for Planting〗- The wooden foot height is 27.6''. You don't need to bend down while planting and clipping. 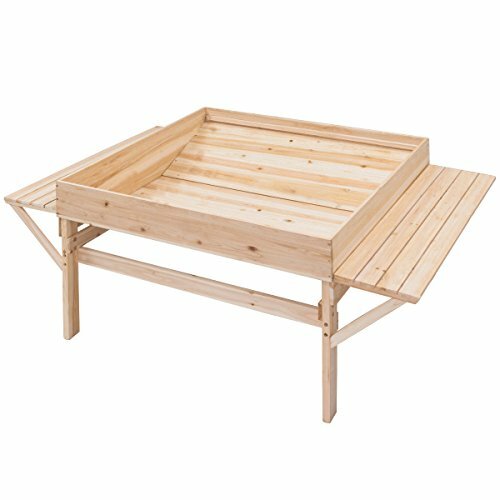 〖Solid Fir Wood Construction〗- This garden raised bed is made of fir wood and has four sturdy legs. Each wood panel is thick enough. They makes the planter serve long time.